Download 5 Autodesk Smoke graphics templates for free. Learn how they were created using Timeline, ConnectFX and Action. I recently had the privilege of being asked to create some motion graphics templates for Autodesk Smoke. Because of my history in using Smoke in broadcast, where you often have to edit and create your own graphics, I have gotten pretty good at pushing the tools in Smoke. These are some examples of the things that you can do inside Smoke’s 3D compositing environment. 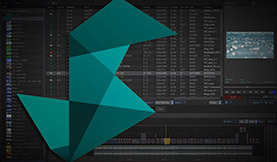 Many of these Smoke templates use the timeline compositing, as well as ConnectFX and of course Action, the heart of CFX. Each of these downloadable templates for Smoke comes with a 20-30 min video explaining how it was built, and how to modify it to your own needs. Every major component of the templates are LIVE, which is to say that there are little to no pre-rendered elements. They are completely adjustable. Template archives are compatible with Smoke 2013 Extension 1. Don’t have the latest version of Smoke yet? You can download the free 30-day trial here. Here is a breakdown of the Smoke templates and what features they showcase, along with a little behind-the-scenes of what went in to creating them. The Box World Smoke template showcases a 3D environment where you have a dozen 3D Cubes with a camera flying through the scene. You can map different images to the cube as well as change the matte transition that reveals the images on the sides of the cube. One of the cool things about this template is that it uses a timeline trick to transition from one 3D animation clip to the next, by using a simple keyable box transition which hides a simple vertical wipe. This allows you to change the camera animation and the length of any of the scenes just by trimming the clips. The TypeLand template showcases the use the 3D Text in Smoke’s Action Node. It creates a world of 3D Text on the ground with bold stand out words rising above them. It’s a simple, yet elegant graphics template that you could further enhance with 3D Lens Flares or other 3D or 2D elements. This template also uses the timeline to break each scene up in to it’s own CFX clip. That way each scene is manageable and in fact, they are simple copies of each other where only the camera and text have been changed. So you can create as many variations as you would need to suit your own design. Separating the Text Animations are 2 different video walls where you can map your own video images. One video wall is 6 cubes showing the same image, and the other is a 6 cube wall that shows different images on each block. Shadows and Ambient Occlusion passes from Action are composited via ConnectFx as well as the Depth of Field Node. The Dancing Panels Smoke template is my personal favorite. It has a very classy, yet energetic feel to it. The 3D animation is fluid and the lens flares feel very natural in the scene. This template has 2 very special components to it. The first is the 20 panel FBX 3D Model. This model looks complex in the schematic, but is pretty well organized. It allows you to map different images to the Front, Back and Sides of each panel. The cascade of the panels is driven by the animation of just the first panel, which then drives the expression to the other 19 panels. You can easily change the frame rate of the cascade by adjusting just 1 value. The second feature of this Smoke template is the camera rig that generates the reflection on the floor. Now I must admit I didn’t invent this rig. 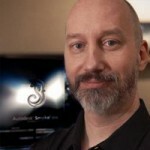 It was first shown at a Autodesk Flame Users Group Presentation at NAB 2013. Philippe Soeiro, the Lead Product Designer for Autodesk Flame & Smoke showed it as part of a demo that year. The rig creates a mathematically inverted camera which creates a reflection on the floor plane. The reflection is then compositied post-Action node where you can control the blur and transparency. It really is genius. I would grab this template just for that camera rig alone. You can then save it and reuse it in any of your own 3D Action setups. DOWNLOAD THE FREE SMOKE TEMPLATE NOW. There are 2 types of image mapping you can texture your 3D text or geometries with: diffuse maps and reflection maps. Diffuse maps are simple textures that map to the UVs of the geometry and as the geometry moves the images sticks to the surfaces. But with reflection maps, you can add some environment refections from your scene to the object as well. Normally you would do this as a additive mix with your diffuse map, to enhance the realism. But if you use the reflection by itself, and use it full, then you can create this glassy, reflection and refraction look. Add a bit of lighting and some nice motion design and this template was born. One other cool thing to note about this template is that it is modular on the timeline. Each new scene uses the ConnectFX Back Clip to see through to the layer before, and then does its wipe transitions to bring on the new scene. SO you can mix and match these layers around to create new renditions of this template pretty easily. Let’s make a graphics template using the classic ink and sketch look. The node is very powerful and uses a Photoshop type of layering process where each layer can have a matte channel with it, and be assigned to be a canvas, edge, or drawing layer. You then alter the priorities of the layers and use any of the Photoshop Blend modes to create the look you want. Now good looking inky sketch drawings from video are not always easy and they take time and effort to make them look good. Rarely is it a one click operation on the plugin. The Stylize Node is no exception. I used ConnectFX to mix different version of the Stylize node together and then mix back the original image with a sepia color correction. By doing this and using some inky revel mattes, the images are blended and create different levels of ink and sketch to finalize the image. Each clip is really just a copied effect of the previous one with different images and camera moves. I hope that you find these free Smoke templates useful and educational. The templates are all project archive. Here is a Tutorial on how to load each one into Smoke. Enjoy and feel free to comment below or ask a question about any of the templates or videos!